This section describes how you can install a new License File to replace the default Free 3-day rolling window license. 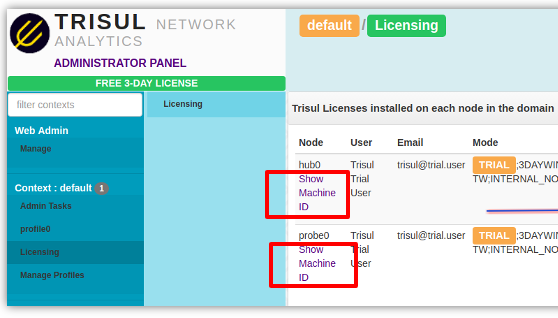 Once you have decided which license type suits you, you need to get the Trisul Machine ID that uniquely identifies the server or VM on which you are running Trisul. Using this alternate method to get the machine ID. Type the following command as send us its output. On the Licensing page you can click on the Upload Button shown in the image below to select the new License file and upload it. The following alternate method places the new License files directly in the correct directories. You can use this method if the User Interface is not suitable for you. For example : when you want automatic deployment of license files. Edit the LicenseFile parameter in trisulProbeConfig.xml to point to the new file. The trisulProbeConfig.xml file is a per-context config file found under /usr/local/etc/trisul-probe/domain0/probe0/context0 directory. Edit the LicenseFile parameter in trisulHubConfig.xml to point to the new file. The trisulHubConfig.xml file is a per-context file found under /usr/local/etc/trisul-hub/domain0/hub0/contextXYZ directory. The current license file is displayed as shown in the screenshot above. If you move any Trisul node (Probe or Hub) to a new machine or VM, send us the new machineid and we will reissue the License.